The Colome Cowgirls used balanced scoring as they defeated Gregory 52-43 on Feb. 15 in Colome. Callie Heath, Mariah Kinzer and Taylor Hrabanek all scored 14 points. Colome grabbed 28 rebounds and were led by Heath and Hrabanek with 7 each and Kinzer with 6. Colome had 11 turnovers and 8 fouls in the game. Area students were candidates for graduation from South Dakota State University following the fall session. The graduates include: Morgan Hughes, Colome; Kirsten Jorgensen, Ideal; LaTora Becker, Hamill; Dane Driscoll and Justin Heubrock, both of Winner. Two Winner students have been named to the fall semester dean’s list at the University of Sioux Falls. Named to the list were Dayna Diez and Haley DeMers. Both are nursing students. Gov. Dennis Daugaard has proclaimed Feb. 22-27, 2016, as Bald Eagle Awareness Week in South Dakota. Free events are scheduled across the state and interested individuals and students have a variety of opportunities to learn more about birds of prey. On Feb. 25, the Outdoor Campus in Sioux Falls will host an open house with a free program beginning at 6:30 p.m. CST featuring live birds of prey. This free event is presented by educators from the Raptor Center at the University of Minnesota. Visit outdoorcampus.org or call 605.362.2777 to register. On Feb. 27, the Pierre Ramkota, in conjunction with the KCCR Farm, Home and Sports Show, will host free programs featuring live birds of prey beginning at 10:30 a.m., 12:30 p.m. and 2:30 p.m. CST. These events are also presented by educators from the Raptor Center at the University of Minnesota. Also on Feb. 27, the Outdoor Campus in Rapid City will host a free raptor-themed open house. The Black Hills Raptor Center will present at 1 p.m. No registration is required. Bald Eagle Awareness Week is an annual event; sponsored by conservation and outdoor recreation organizations, merchants and conservation agencies to increase public involvement and awareness about bald eagles and other birds of prey. 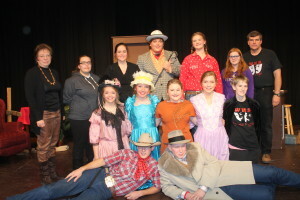 The Winner High School drama department will perform “The Wizard of Oz” on April 7-9. The cast for the play are: Molly Connot, Kenzi Irick, John Kludt, Matthew Hartley, Sydney Peters, Molly Sperlich, Hayley Halverson, Emily Moser, Shannon Duffy, Sadie Woods, Gracie Littau, Mary Calhoon, Liz Jankauskas, Katy Lantz, Duncan English, Grant Winter, Jacob Woods, Nick Blare, Mason Schuyler, Ty Bolton, Isaac Naasz, Hunter Shopene, Luke Engel, Jonas Brill, Brielle Bachmann, Alex Meiners, Jace Voegeli, Korrina Williams, Bethany Cable, Eleanor Moleterno, Andrew Taylor, Angel Shaw, Taylor Headrick, Shelby Scott, Arista Kaiser and Kayla Natoli. 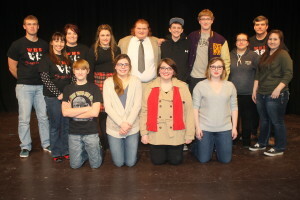 The play is directed by Kelly Assman and Kara Connot. The technical director is Dan Patmore. 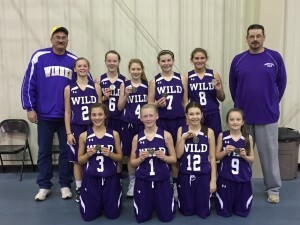 Winner Wild defeated Yankton 40-34 in the championship of the Huron Tournament on Saturday. 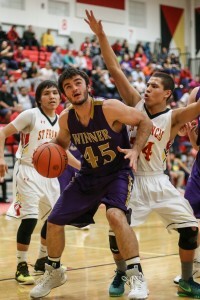 In the first game, Winner Wild defeated Mitchell Thunder 40-8. In the second game, the Wild won 54-32 over Aberdeen Roncalli. The next tournament is at the Stuart Athletic Club. Winner Area wrestling team took 7th place at the Huron tournament on Saturday. Five Winner Area wrestles placed. Atlas Willuweit took second, Trevor Peters and Kayleb Brozik, both 5th , Colby Curtis and Jayden Schroeder both took 4th. Curtis, 126, lost to 5-2 to Dawson Kremlacek, Brandon Valley and Schroeder, 195, lost 5-3 to Colton Koslowski of Webster. 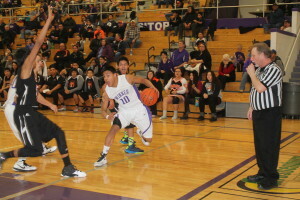 Winner High School boys basketball team cruised to a 73-30 victory over McLaughlin Friday night in Winner. With the victory, the Warriors improved to 12-5 for the season. 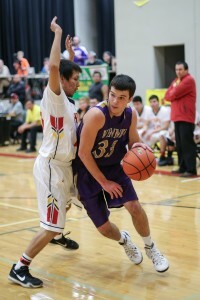 Trevor Bertram lead the team in scoring with 14 points followed by Devon Leiferman and Wyatt Ewing with 10 points each. Cameron Kuil scored 9 points, Krockett Krolikowski and Lattrel Terkildsen, 8 each and Drew DeMers, 7. Leiferman pulled down 8 boards and Drew DeMers had 6 assists. Devon Leiferman’s 25 points helped propel the Winner High School boys basketball team to an 82-55 victory over St. Francis last Tuesday. The Warriors had balanced scoring with Cameron Kuil, 15 points; Drew DeMers, 11; Krockett Krolikowski and Trevor Bertram with 8 each and Chase Kingsbury with 7. Kuil pulled down 11 rebounds, Leiferman, 9 and Wyatt Ewing, 7. DeMers had 8 assists and Bertram, 6. 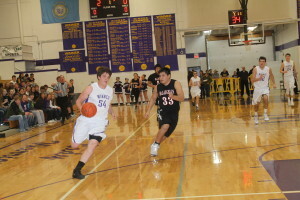 Reed Harter scored 24 points as the Colome boys basketball team defeated North Central 67-54 on Feb. 9 in Colome. Holden Thieman added 15 points, Kelly O’Bryan, 12 and Jackson Kinzer, 9. Thieman pulled down 14 rebounds with Kinzer grabbing 9. With the victory, the Cowboys improved to 10-5.